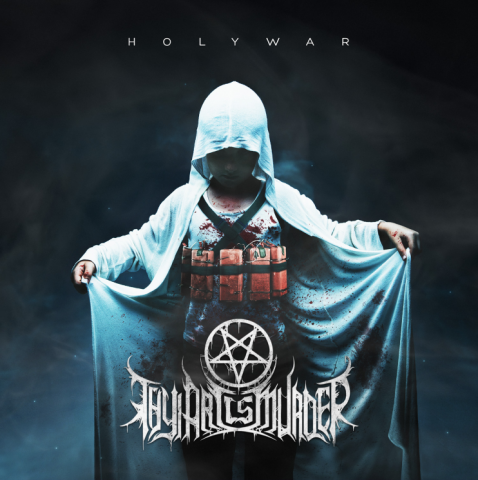 The Australian deathcore band Thy Art Is Murder released a video for the song "Light Bearer", taken from their upcoming album "Holy War". It was directed by Yves Otterbach and produced by Benjamin Richter (Ambitious Films). "For the last few years since the "Reign of Darkness" video came out, the only thing we've all been obsessed with was having fire in our next clip," — the guitarist Andy Marsh comments: "With a title like "Light Bearer", it all came together thematically and our friends at Ambitious Films understood our vision and helped make it a reality. We are so excited to bring you guys new music and a new video." The group's third full-length release "Holy War" comes out on June 26 via Nuclear Blast. Below it's the original uncensored cover artwork, created by photographer Thomas Savage, who also took part in the filming of the video "Light Bearer". In support of their newalbum, Thy Art Is Murder will go on European tour, which will begin with a concert at the club "Sound Control" on August 11 in Manchester and will end with a performance at the German Destruction Derby Fest on August 22. More tour dates are available on the label's website.